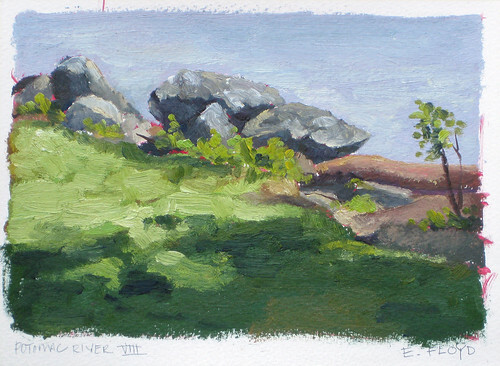 Here are the plein air studies completed from last week. My goal is to get out and paint 3-4 times a week, last week I was able to go out three times, on Sunday I was out for an extended time so two studies were completed. I also switched over to using gessoed watercolor paper as my painting surface, it is an easy surface to paint on because the cold pressed watercolor paper has a bit of a texture and the gesso provides a level of tooth for the paint to grab onto. Another benefit is that because I gessoed several sheets of paper, I feel free to explore and experiment with out concern about wasting a canvas panel or the need to wipe down the painting when it does not work out. With the gessoed paper I will have a timeline that records progress. With this study I was working on the gradation of the sky along with the atmospheric graying of the distant trees and shore. 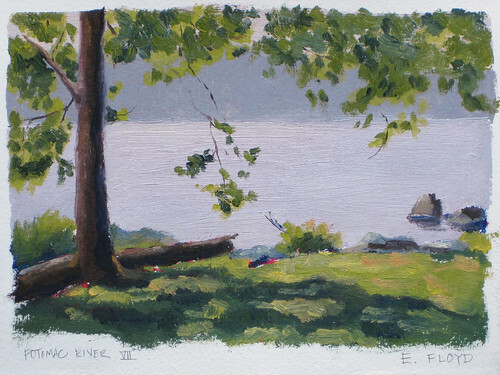 When working in plein air I often block in my drawing using aliz. crimson, so sometimes the thinned red will peep through. 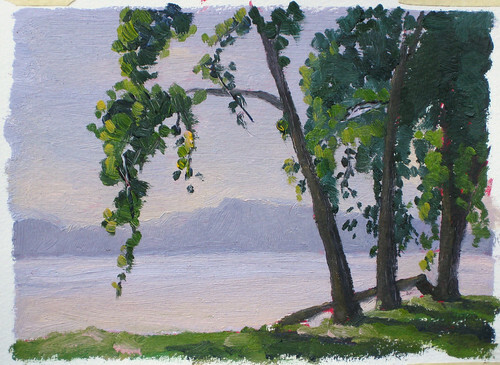 A few days before I headed out to paint the last two studies of the week I spent an afternoon reading through Marc Hanson's blog Painting My Way Through Life. 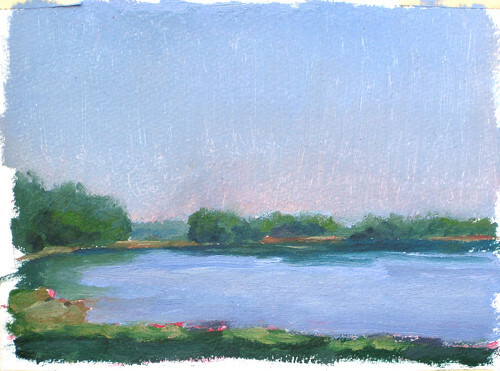 Back in April 2009 Marc Hanson set a personal goal of completing four paintings a day en plein air for the entire month, that is for 30 straight days, he called it a "painting marathon". I visited every blog post of that month and read about his experiences, it was so inspiring... I guess in a way I am trying to do something similar but a lot more open ended. Before beginning this study I had set a goal of trying to complete each within an hour, and I wanted to make sure my composition was more of a vignette, giving a specific impression of a scene that captured my attention. I did not complete this in my time limit, however the play with fore, middle, and back ground was a good exercise. Learning to capture the big shapes and values is important to me, however I also need to spend time on developing the abilty to paint the smaller details like, rocks and such. So this study focused on the rocky edge of the Potomac. I am was out painting this morning, the weather has returned to the normal temperatures DC is supposed to have during this time of year. It was a beautiful morning.